This topic contains 4 replies, has 2 voices, and was last updated by Bill Robbins 4 years, 8 months ago. I have a problem, I have put pictures and the text either on the right hand side of the pictures, never below the picture, but she says that in her computer she sees the text below the picture, and I see it as I have put it right next to the picture. Can you have a look at and see how you see the website please? Please let me know how you see it and if possible send a screen shot. pages , about us, design management, tender, construction planning, claims. please check how they loo, they should have the picture and the text right next to it Not below any of the pictures. It will depend on the browser window size to a degree. I’ve attached a screenshot that has a typical desktop sized browser and a much smaller one side by side. Since the image is the first thing there in the HTML document, as the screen is smaller, it’ll appear first because technically it’s before the text as you read down the source code. But it’ll have to be pretty small for that to be the case. In my browser, both mozilla( firefox) and Enternet explorer the webpage looks the same. however my friend says that she is using google chrome. do you think that is the reason why? Also the tabs are all in one line on my browsers but on your screenshot some are at the top and the some underneath. 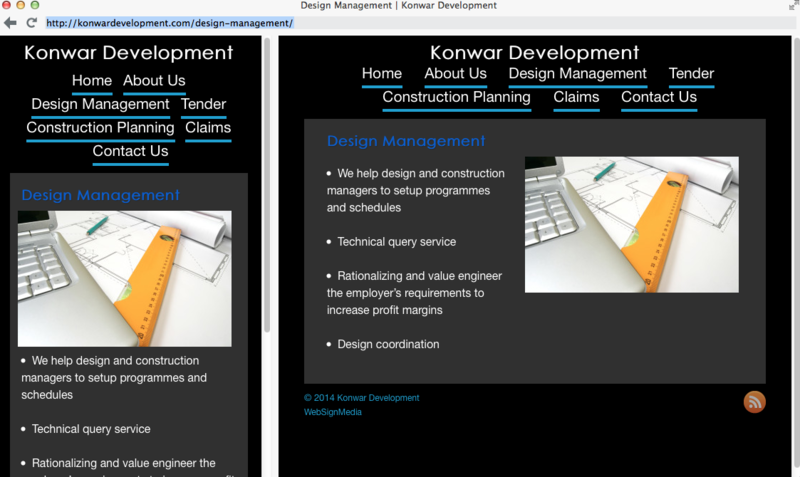 also the konwar development is on the left hand side of the page all through, in every single page. Maybe I’m doing something wrong? I would get her to send you a screenshot. She most likely has the screen size set really small, or she’s viewing on a tablet/phone and didn’t mention that. The topic ‘website doesn't look the same on different computer’ is closed to new replies.